System implementations and conversions are complex projects that involve successful execution in many different areas to ensure they are effective. 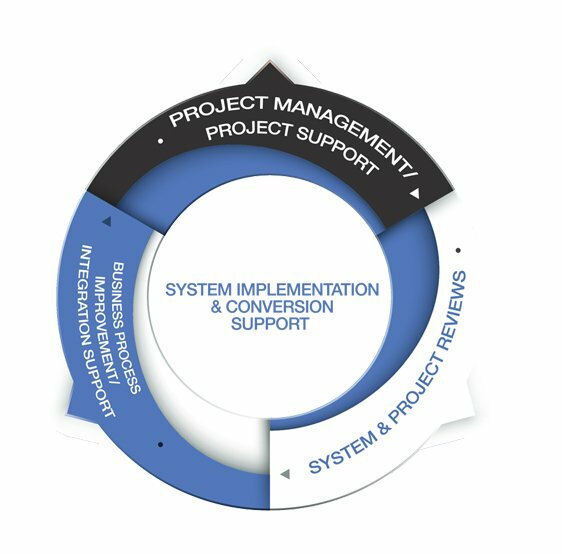 At Emergent Partners, we have structured our System Implementation Support Practice to help you formulate the right strategies for your project, building a strong foundation of effective business processes and proper planning to help make your project a success. Proper business process integration is critical to the success of any implementation or conversion project. We help you make sure that business processes align with system capabilities and that those processes are robust enough to provide a foundation of accurate data for your new system. Are you in the planning stages for an implementation or conversion project or are you just starting to consider upgrading a system? Using our process for reviewing projects and business processes and the high level of experience and expertise of our consultants, Emergent Partners can help you make good decisions in the early stages of your project. We can review existing systems and help you decide whether or not an upgrade is necessary. If you are in the early planning stages, we can show you which of your business processes would need to be improved to facilitate a successful implementation and prioritize those improvements to minimize your expenditure. Are you in the middle of an implementation or conversion project? For ongoing projects, no matter where you are in the project lifecycle we can show you how to improve the effectiveness of your project. If you are over budget or behind schedule, we can recommend to you how to get your project back on track.